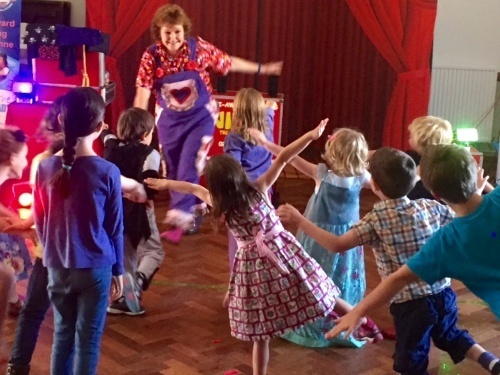 I was booked to perform my comedy magic show at Shannae's 7th birthday party at the Milton Village Hall in Portsmouth recently. I performed for Shannae's sister a couple of years ago and was asked back to perform again which was lovely. 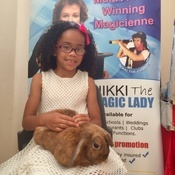 As you can see in the picture She fell in love with my magic bunny rabbit smudge who got lots of cuddles from her. 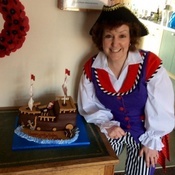 Here is a picture of me dressed as Nikki the magical pirate pictured next to this fantastic pirate birthday cake. I was just about to set up my pirate themed magic and games show, But I couldn't resist taking a moment out to have a snap with this mini nautical masterpiece. I think the person who made this has an amazing eye for detail. The photograph really doesn't do it justice. 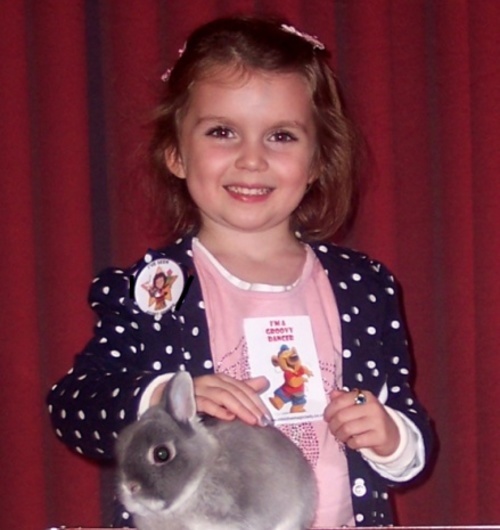 Children love animals and this picture really sums up the amazement on their faces, When they get to meet one of my pet doves or one of my magic bunny rabbits In the show. 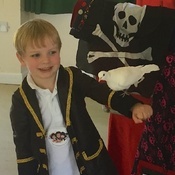 I was performing my comedy magic show for the children at the Jubilee Village Hall in Catherington near Waterlooville in Hampshire at a pirate themed party when this picture was taken of the birthday boy as he met one of my doves. 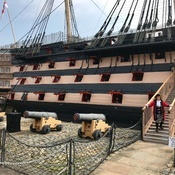 As you can see from the picture, I am on board HMS Victory Nelson's magnificent flagship which is based down in Portsmouth in the historic dockyard. 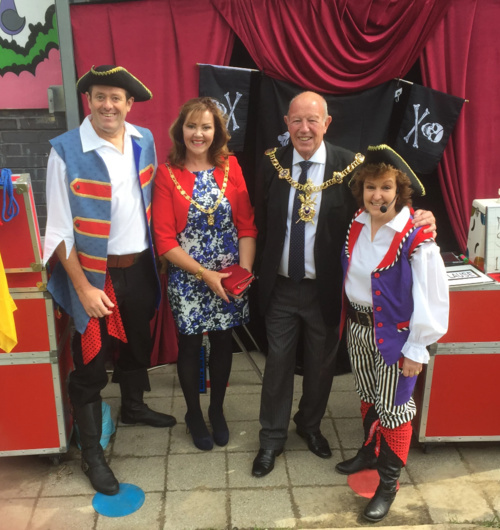 I was booked to entertain the hundreds of visitors with balloon twisting as Nikki the Pirate. We were so lucky it was an amazing day and the sun shone the whole time. I met people from all over the UK and many more from abroad. We really are so very lucky to have such amazing history right on our doorstep. 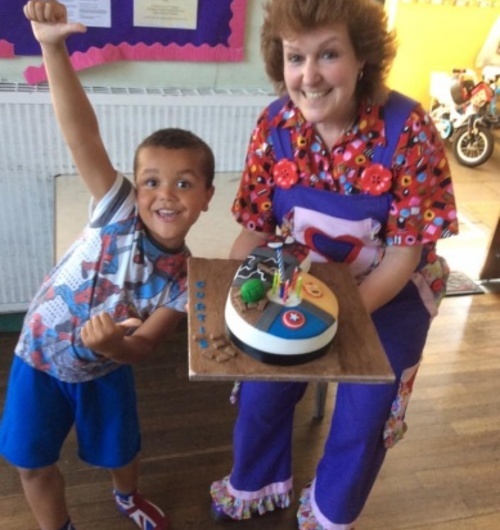 Birthday Party For A Portsmouth And Spiderman Fan In Bedhampton. 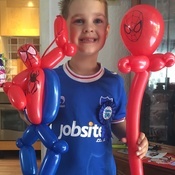 This is Samuel from Bedhampton near Havant in Hampshire, As you can see from the picture, he is not only a big Portsmouth football club fan and he also a huge Spiderman and super heroes fan. 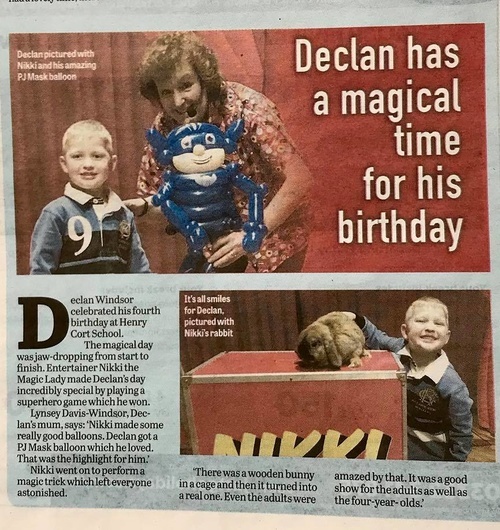 I Was booked to perform my disco, magic and games show At his birthday party recently and he absolutely love the Spider-Man balloons that I made for him. Here is a picture of me with the birthday boy Curtis, taken recently at his party in Havant Hampshire. As you can see from his amazing cake, he absolutely loves superheroes so I themed some of the games for him and made him a special balloon Spiderman as an extra present. 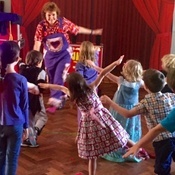 Here's a picture that was kindly sent in recently of me having fun with the children at a party that I performed at in Cowplain in Hampshire. We were all performing party dances during my full 2 hour disco magic and games show. and if my memory serves me right, this was during superman, which I often put in for the boys at the party. We had a great time and they were a lovely bunch of kids. Thanks to the birthday girl Emily's Mum for the picture. A party I performed at recently was featured in the Portsmouth News. 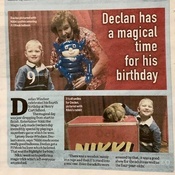 The little boy whose name was Declan, Invited me along to perform my Disco Magic and Games show at his 4th birthday party at Henry Cort School in Fareham. 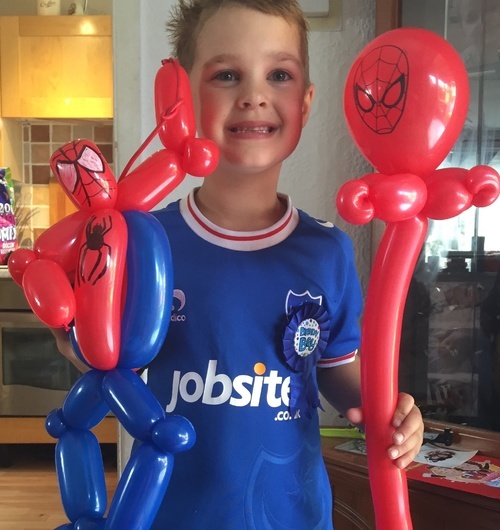 Declan is a big fan of PJ masks so I made him this Cat Boy balloon, He is also pictured along with my pet magic bunny rabbit Smudge who made an appearance at the end of the party to the delight of everyone. 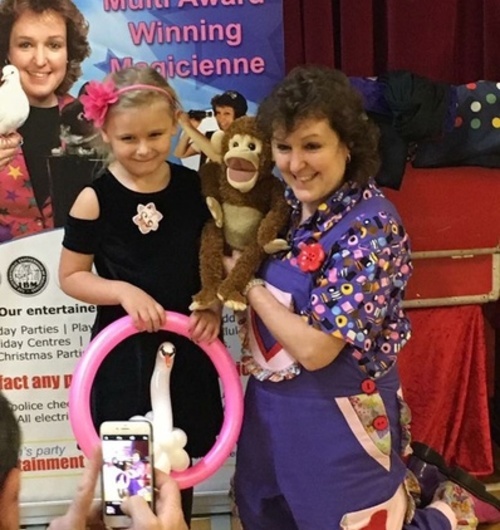 I was booked to perform my disco, magic and games show at this little girls 6th birthday party at the Southsea Caravan Park recently. We had a great time and our birthday girl particularly loved dancing to all the latest chart hits, she was quite the little mover. 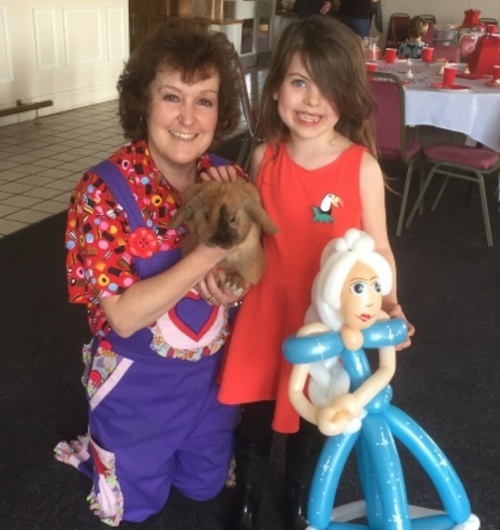 She was also a huge Disney's Frozen fan so I made her the balloon Elsa that you can see in the picture. 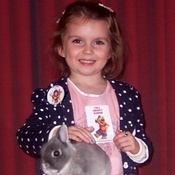 She also loved meeting Smudge the magic bunny. Here's me on stage with the birthday boy at his 5th party. We had a great time, he had over 40 of his friends attending both boys and girls on his special day. 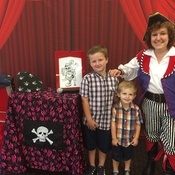 He helped me in the magic show and was a great magical assistant. He also loved the party dances and disco dancing. He looked such a cool dude. 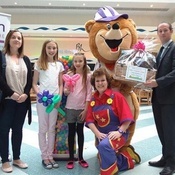 Here is a picture of me that was taken when I was performing at Fareham shopping centre in Hampshire over Easter I'm actually pictured with the winner of the competition who correctly guessed the number of Easter eggs in a container. Here she is with her sister. They are holding balloon flowers that I made for them. 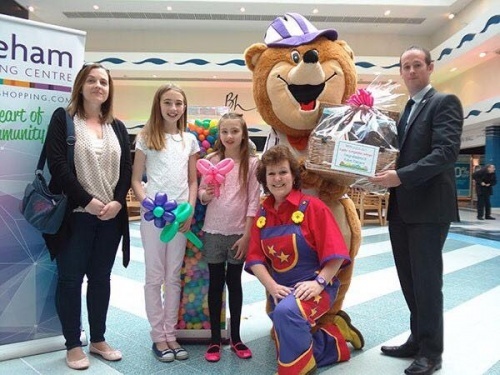 I was there entertaining the children with balloon modelling also in the picture is the store manager who presented 11 year old Robyn with her prize and Toffee the Bear. 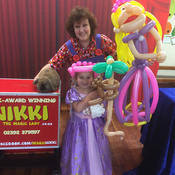 Nikki the magic lady regularly entertains at hospitals in both Portsmouth and Southampton for the children's charity POD She brings smiles to the poorly children's faces by performing close-up magic and also twists balloons making them a variety of different characters and animals. 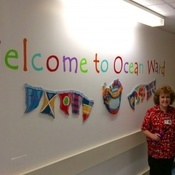 Here she is pictured just about to go onto the ocean Ward at Queen Alexandra Hospital. 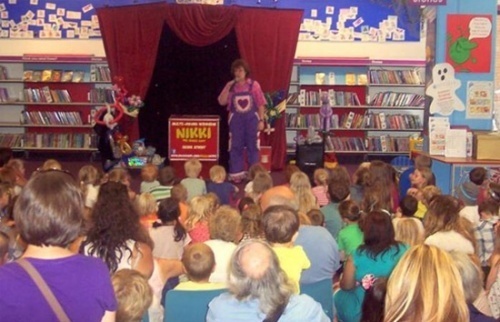 Fareham library laid on entertainment recently, in the form of Nikki the magic lady. 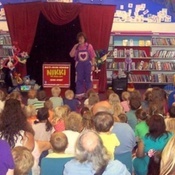 Who performed her comedy magic show for over 125 children, Who were accompanied by their parents and guardians. Nikki was ably assisted by her amazing pet magic rabbit rocky, Who was a real hit with the huge crowd. 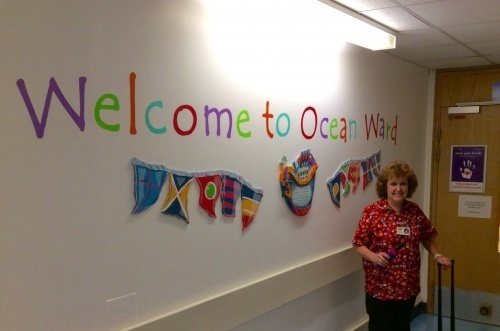 The event was to launch a children's reading week and seemed very popular. After all anything that gets kids reading books is a good thing. 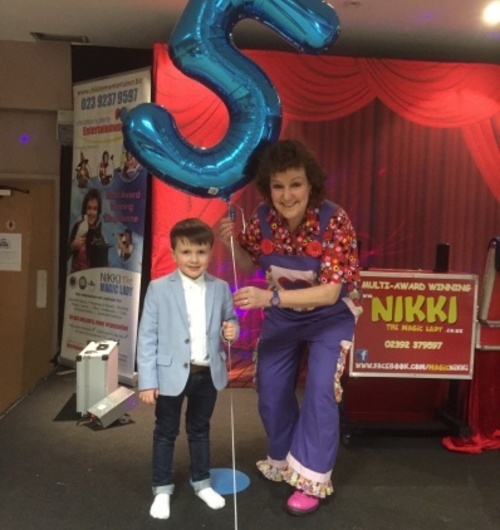 The feedback from Nikki's performance was fantastic and the event was a great success. Nikki had the children in the palm other hand and the laughter that was generated was amazing. I recently performed at Olivia's Halloween themed birthday party as Izzy Wizzy Witch. I performed my disco magic and games show for Olivia and all of her friends. There were spooky Halloween themed games, Lots of Halloween disco dancing and party dances as well as a spooky magic show. Olivia's face was a picture when she conjured up my magic bunny rabbit at the end of the show and from the lovely comments I received at the end of the party, everyone seemed to have a great time. The party took place at the goals soccer centre in Portsmouth, Hampshire. 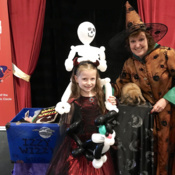 You can see Olivia here pictured along with me, holding a skeleton and a witch's cat that I twisted out of balloons for her. 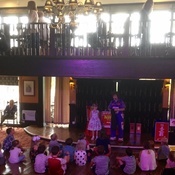 Here is a picture taken of me performing my comedy magic show today at a holidays centre called Medmerry Park which is in Earnley near West Witttering in West Sussex. I have been performing here for many years and I absolutely love it. They are always a great crowd. Wow! What a great honour this was. 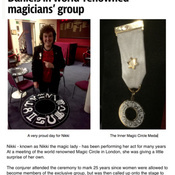 I attended the world famous London Magic Circle to commemorate 25 years since ladies were allowed to become members as I was one of the very first and whilst watching a show in the theatre at the very end, I was asked to join the vice president on stage in the Magic Circle theatre and I was presented with a medal and the honour of becoming an associate of the inner Magic Circle with silver star. It was such an emotional occasion and I don't think I will ever forget it. I am so proud and I keep my medal in pride of place at home. This has to be one of my all-time favourite pictures of a child taken at a birthday party that I performed my magic show at. She is just so photogenic. 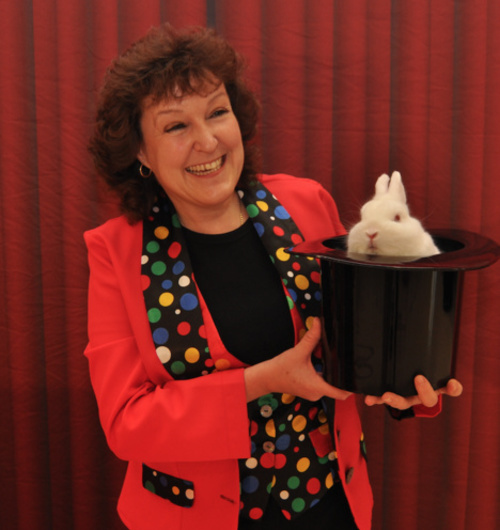 I remember the day well, she was absolutely blown away when she tapped the magic wand on the box at the end of my show and a real live bunny rabbit popped out. her face was an absolute picture. Bless her. Here's proof that you are never too old for bunny cuddles. 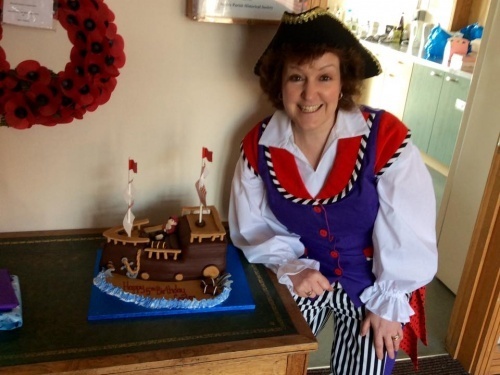 This is the Big Sister of the birthday girl whose party I performed at in the catholic Church Hall in Stubbington near Fareham. 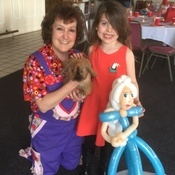 She was loitering around at the end of the party watching all the younger boys and girls at the party stroking the bunny rabbit and when I asked if she would like a cuddle she jumped at the chance. She absolutely fell in love with smudge the magic bunny, so I took this picture of her as it was so cute. Here's a picture of me with one of my pet doves. They are such beautiful creatures and I've had this one since it was a baby, I hand reared it from a hatchling. 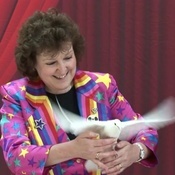 I have four doves in total and they have been performing with me in my children’s magic shows for quite some years now. As I've been handling them and training them since babies it's amazing to see them get so excited when they know their part of the show is about to come up. 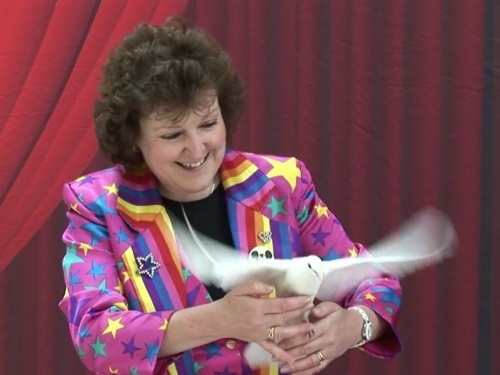 Usually I take one of my pet rabbits to every performance, but if you'd like to see one of my doves in the show as well as the bunny, please ask when making a booking. 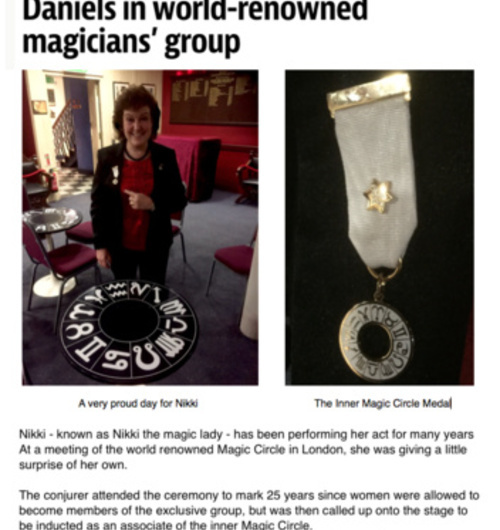 Nikki Is Asked To Be A Speaker At The World's Largest Magic Convention. 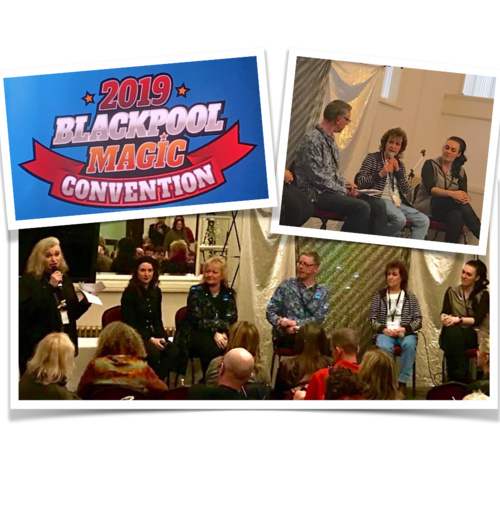 Nikki was asked to be one of the speakers taking part In a debate on female magician's at the Worlds largest magic convention in Blackpool recently. 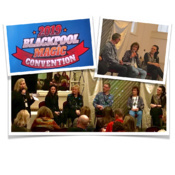 The convention has 4000 magicians attending from all over the world. So it was quite an honour for Nikki to be asked to represent the ladies. 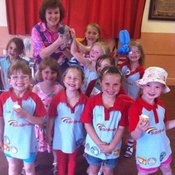 Nikki was invited back to perform at an end of term rainbow group party in Gosport near Fareham recently. As well as cake making there was lots of other great fun things to do and Nikki was invited along to entertain the children with her comedy magic show which was really well received. 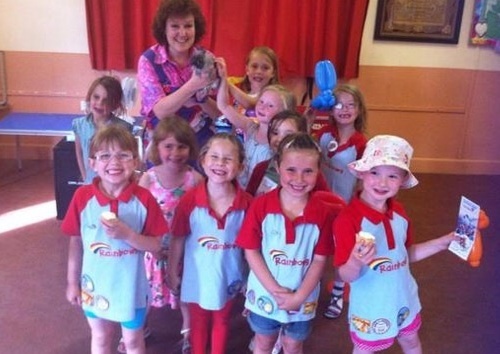 Nikki often performs for quite a few scouts, guides, brownies and rainbow groups throughout the year with magic shows, discos, balloon modelling and magic workshops and really enjoys her time with the children as you can see in this picture. 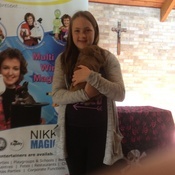 The children also all loved meeting Nikki's lovely little magic bunny Rocky who was the star of the show. 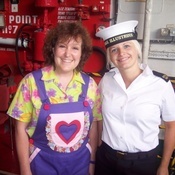 I performed on one of the last ever families days on board HMS Illustrious before it gets decommissioned. I was hired to entertain the children and their families with magic and balloon modelling throughout the day. It was a happy yet sad day. 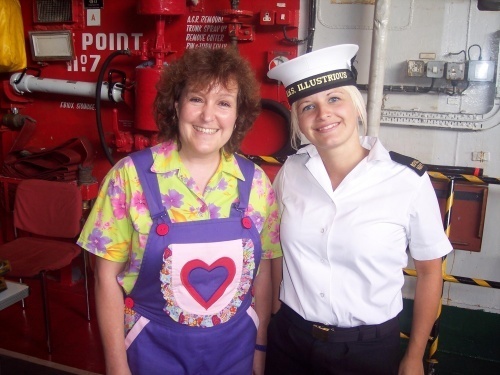 Happy because we had such a great time and sad thinking that poor old rusty lusty as the sailors call her was coming to the end of her amazing naval life. 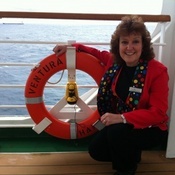 Nikki The Cruise Ship Children’s Entertainer. 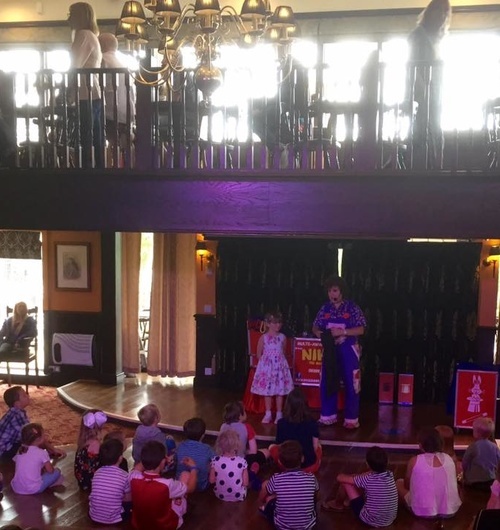 As well as being a busy birthday party magician and balloon modeller, I regularly perform on some of the worlds top cruise ships with my husband Charlie entertaining the children and their families on board with our comedy magic shows and various workshops. 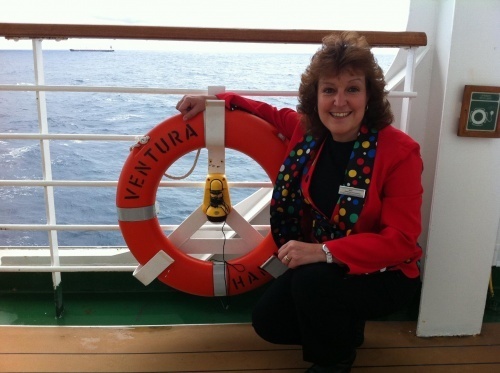 We've been all over the world and are lucky enough to have visited such places as far away as Australia, the Caribbean and many other countries and islands around the globe. We always have a great time and meet some amazing kids and parents along the way. 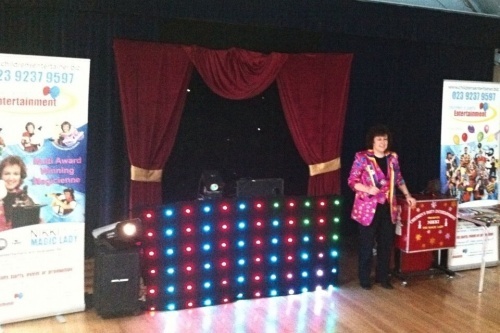 This picture was taken of me at an infant school disco recently, I perform lots of discos with my husband Charlie at schools, pre schools, Christmas and Halloween events, New Year's Eve parties and corporate fun days. We've really worked hard on our show and have a state of the art set up that we are really proud of now. 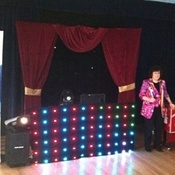 Our shows include disco, games, magic, party dances, puppets and lots of prizes and giveaways. 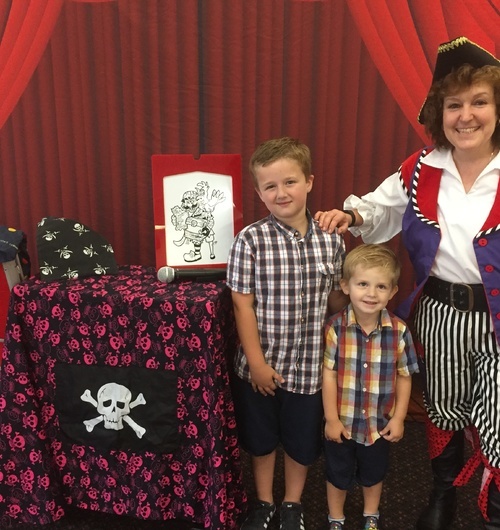 Here is a picture of me as Nikki the pirate along with seven-year-old Charlie and his little brother Archie. 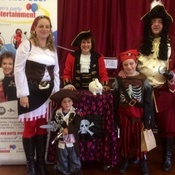 It was taken at Charlie's birthday party in Stamshaw Leisure Centre in Portsmouth. Where I performed my pirate themed music magic and games show. 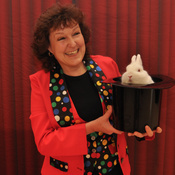 Charlie was a great little magician Helping to conjure up my magic rabbit Smudge at the end of the party. 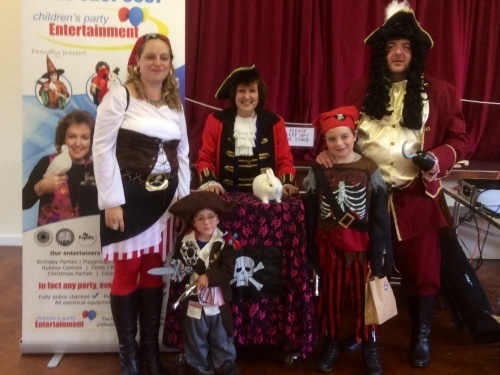 In this picture you can see me as Nikki the pirate along with 5 year old Thomas and his family who also all dressed up as pirates. There was lots of skulduggery going on as we had fun with pirate themed games, pirate music, party dancing and a themed comedy magic show. I performed at Thomas's older brothers birthday party awhile back and was invited along to have fun this year with Thomas and all of his friends. He is a picture of me taken recently at an adventure playground in Portsmouth. 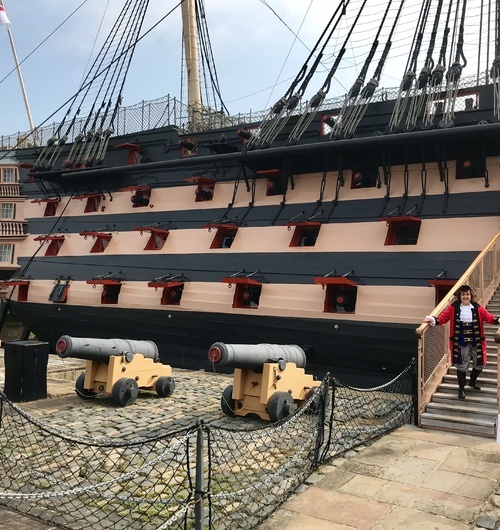 We were booked by Portsmouth City Council who were launching a brand-new pirate ship structure. 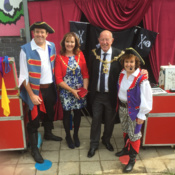 We performed our disco magic and games show for the children and families and here I am pictured with the Lord Mayor of Portsmouth and the lady Mayoress and my husband Charlie. We had a really great time and the sun was shining for the whole day. Nikki recently performed at Emily's birthday party in Rowland's Castle near Havant in Hampshire. 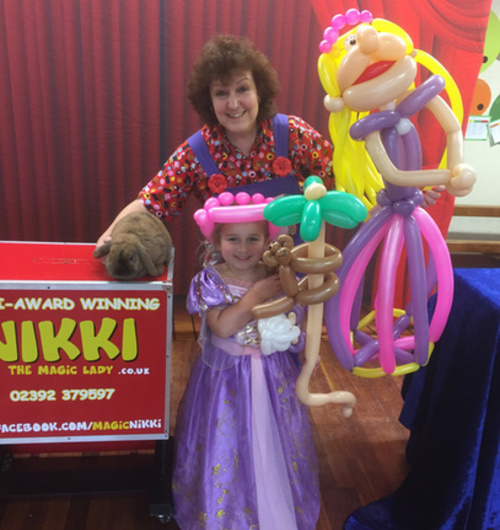 As you can see Emily loves princesses and she is pictured along with Nikki and smudge the magic bunny rabbit that Emily helped to reduce from the magic box at the end of the show and iEmily s holding an array of special twisted balloons that Nikki made for her. Her favourite being the princess that was wearing the same colour dress as her. 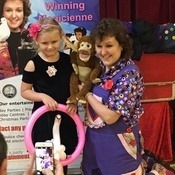 I was booked to perform my music magic and games show at Lexi's 6th birthday party at the weekend at St John's church hall in Fareham in Hampshire. Lexi and all of her friends had a great time dancing to all the latest songs, helping me in the comedy magic show, joining in with all the party dances and I think they all especially liked winning all the prizes. Here is a picture of Lexi meeting my naughty friend cheeky monkey. The birthday girl was a fantastic helpful and helped me to conjure up a real live bunny rabbit at the end of the show, so I gave her this balloon swan that I made her for helping. 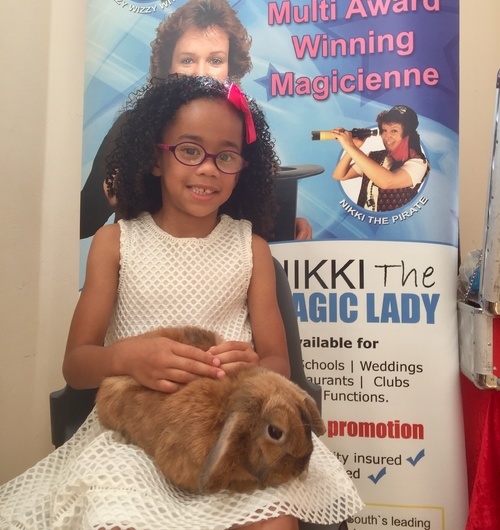 Children's entertainer, Magic Nikki, kids birthday entertainer, family & corporate shows, covering Portsmouth, Southampton, Hampshire, West, Sussex, Surrey, Berkshire, Wiltshire, Dorset and beyond.